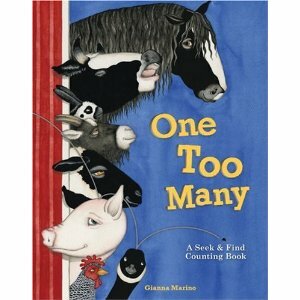 This month, we explored and discovered One Too Many: A Seek & Find Counting Book by Gianna Marino. Bookworm1 surprised me by really liking this book. Not that it is unlikeable. I just didn't think he would get it. But he did and he loved it! On the first page we see a fly bouncing into the page. It, of course, is black. It bounces into two cows - jerseys, of course. By the time you turn the page, you are looking at one fly, two cows and three black and white horses which start to make the eyes feel energetic and the page feel a bit crowded. But we're not done! Oh no! There are a lot more animals to add to this barnyard scene and it because trickier and trickier to count them out of the crowd. Bookworm1 is a fan of the I Spy books so I shouldn't have really been so surprised that he latched on to One Too Many so quickly. From beginning to end, he enjoyed figuring out what animals had joined the scene and was working at hunting them all out! So, despite it's simplistic (and yet complicated!) design and idea, we're happy to recommend this one. Think of it as a sophisticated I Spy book with farm animals. It's definitely more artsy. I don't meant to sound so surprised about liking it but, in truth, I am! Ever been surprised by what your kids pick to love? 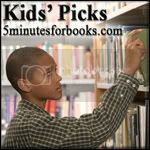 I hope you'll decide to share with us over at 5 Minutes for Books! I'll have to look for this one on the library shelves. I think my little girl would love it! I was just going to recommend I Spy books. But I see you are already on to them. We've learned that the board book versions work best at our house. Even Sam has started pulling them out of the basket and pointing to things. Sounds precious! I think my little guy would like this one too!